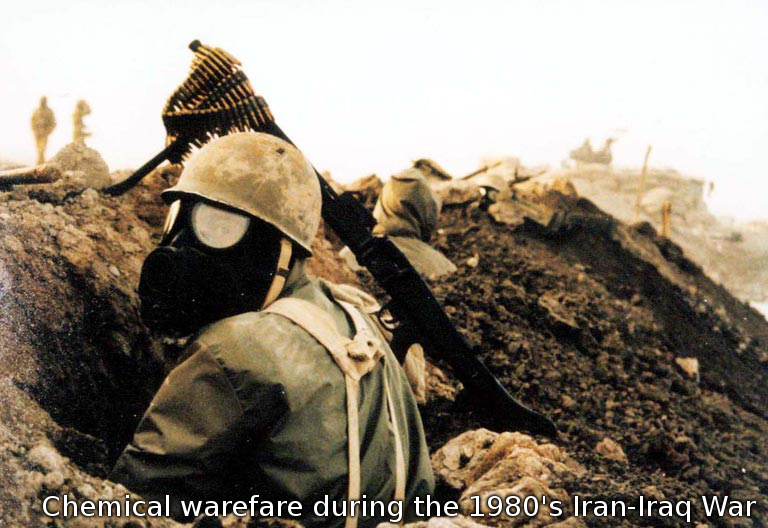 Image: Chemical weapons were used extensively during the 8 year Iran-Iraq War during the 1980's. Despite vast quantities of chemical agents being used, both mustard and nerve gas, these "weapons of mass destruction" would only constitute 2-3% of all of the war's casualties. Not only has the West lied about Syria using chemical weapons, but they have once again lied to the world about the threat posed by such weapons in the first place. The US and its allies have declared the use of chemical weapons by the Syrian government a "red line," that if crossed would incur a direct military intervention which may include air and missile strikes, the establishment of a Libyan-style no-fly-zone, and perhaps even a ground invasion. Surely, the Syrian government would gain nothing from using chemical weapons if by doing so, would give the West a war it has been seeking with Syria and its ally Iran for over a decade. Additionally, by all accounts, including now even the Western media, the Syrian Arab Army has turned the tide and is overrunning NATO's Al Qaeda proxies across the country, including in areas considered "rebel held." Idlib in particular has seen several stunning victories for the Syrian government, despite the province's proximity to NATO-member Turkey, who is openly shipping torrents of weapons, cash, and terrorists over the border. MiGs, artillery, and superior ground forces are indeed vastly more effective than chemical weapons used on any scale, especially in the minute quantities the US is attempting to accuse the Syrian government of using. For a Western population weaned on Hollywood movies, ridiculous TV shows, and an endless torrent of misinformation from their corporate media news outlets, chemical weapons have been portrayed as "weapons of mass destruction," with even small amounts causing catastrophic devastation. Under the best conditions and with vast amounts of chemical agents, large casualties can be produced. But history has shown that generally, anything less than these circumstances would be a waste of time, resources, and of course in Syria's case, politically and strategically unjustifiable. A document produced by the US Marine Corps, titled, "Lessons Learned: The Iran-Iraq War" under "Appendix B: Chemical Weapons," a comprehensive look at the all-out chemical warfare that took place during the devastating 8 year conflict is carefully documented. Several engagements are studied in detail, revealing large amounts of chemical agents deployed mainly to create areas of denial. According the US military's own conclusions, the use of chemical weapons only enhance conventional warfare, but are not suitable for wiping out large swaths of enemy troops. Their effectiveness is such that the Syrian government could not justify their use, thus risk incurring direct Western military intervention. Therefore, for what strategic purpose would the Syrian Arab Army deploy chemical agents on a "small scale?" If the Syrian military already holds the initiative with far more effective conventional weapons, what purpose besides inviting the West to intervene militarily, could using quantities of chemical agents far too small to achieve any tactical gain serve? A Desperate Fabrication - Remember "Curveball"
Conversely, it appears much more likely that such "small scale" use of chemical agents has been used to fabricate a badly needed justification for war with Syria, and open the door for the West to intervene on behalf of a devastated proxy force that is being finally swept away by the Syrian Arab Army. Almost immediately after the US and its allies attempted to accuse Syria of using chemical weapons on a "small scale," global backlash recalled similar allegations, which turned out also to be fabricated, in the lead up to the invasion of Iraq in 2003. Those behind the current conspiracy against Syria hope that the public possesses no understanding whatsoever regarding chemical weapons and their true tactical utility as well as their many limitations. They hope that the public never fully realizes that "small scale" use is essentially an admission that the weapons were not used tactically, but at best, used to fabricate a pretext for war by the West and its terrorist proxies. As the West realizes how politically unsustainable yet another war waged on a blatantly false pretense will be, it may turn to even uglier options in order to topple the Syrian government and to save face after a humiliating stand-down from their "red line." The West's legitimacy has long since been exhausted. Its reputation has been permanently disfigured by special interests that have commandeered and abused it.